Katie Holmes and Bobbi Brown are teaming up to launch Bobbi & Katie, a palette for women with little time for an extensive beauty regime. Katie Holmes, 34, has been the face of make-up brand Bobbi Brown since September. 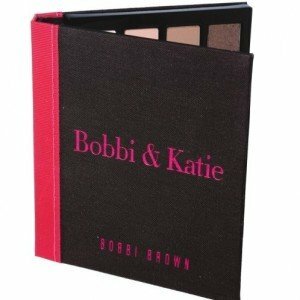 Bobbi & Katie make-up line will feature eye shadows, Pot Rouges and eye pencils in nudes and natural colors for busy women who want a “quick fix”. “Nobody wants to look like they’ve been getting ready for hours,” Katie Holmes told WWD. The collection will feature a $65 brush set, a set of eight eye shadows for $68, two Pot Rouges and an eye pencil. The colors in the palette were apparently inspired by an old pink and brown journal owned by Katie Holmes. “It felt very girly, but at the same time masculine in a way,” Katie Holmes explained, adding that Bobbi Brown was “very open” to using the journal as inspiration for the make-up and packaging. Katie Holmes and Bobbi Brown also took cues from their own busy lifestyles, aiming to create an easy collection for women with similar schedules. Katie Holmes explained that women can apply the cosmetics “in the back of a cab. . . in your bathroom at home. . . [or] in the parking lot at your child’s soccer game”. One of the more effortlessly chic items in the line is the Pot Rouge, which acts as a two-in-one product for cheeks and lips. “It feels like it’s a little secret and it has all of your tricks inside,” the actress said of the collection. “You can quickly get yourself looking the best you could look and then put it back into your bag. “It makes you feel good, and we all want to feel good,” she added. Katie Holmes and Bobbi Brown first began working together last September, when the actress was tapped as the face of the make-up brand. The experience was apparently a positive one, since Katie Holmes and Bobbi Brown are now calling themselves business partners. This isn’t Katie Holmes’ first foray into fashion; in January, the actress signed on as the spokesman for eco-conscious haircare brand Alterna. The Bobbi & Katie make-up collection will launch in select stores in September, and will be followed by a skincare line.